With the US box comming in (US Box in what I just got in the mail) I was finaly able to complete my Greek Rabbit Project. Its been a quest for over a year as I started searching and trading the first Rabbit parts at the end of 2011 with other members out here after having bought a few Greek lots that included the Purple Rabbit and one or two of the less rare colors. Everything seemed to go quite smooth due to the huge amount of knowledge that this board spreads and the great members out here. 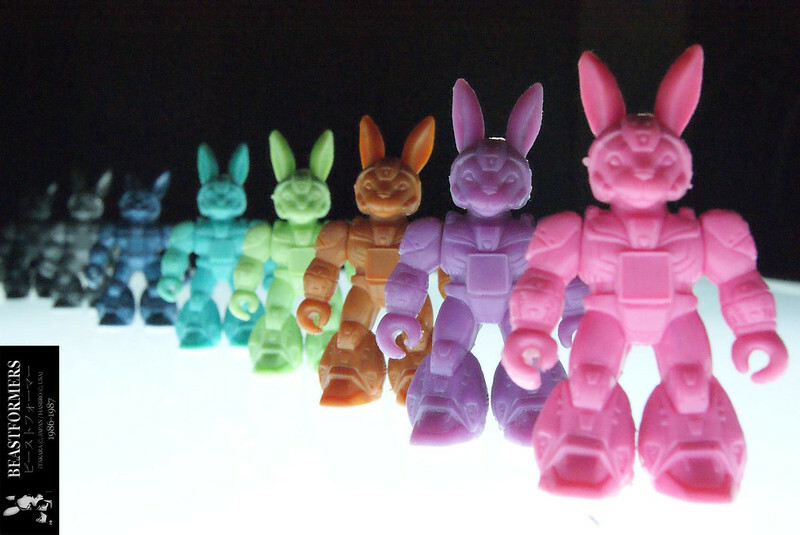 But after I had traded most of the parts and figs it suddenly stopped and I was facing this gap of one Light Blue RA (Right Arm) and a complete Pink rabbit holding me from finishing this idea to built a Greek Rabbit masterset in the 8 main colors. But more and more people where looking out for me (connections from the board and people back in Greece) and it looks like time was on my side on this one because soon after I got the news somebody traced down the Light Blue RA SaltLakeToyJunkee came up with Pinky who'd been stored away in his garage. The Trade ot get Pink was a tough one (see WANTED topic) but I managed to work out that complex trade. And today I was finally able to complete my set resulting in the photo's above of all 8 Rabbit colors. So I'd like to thank all the people who've directly or indirectly helped me getting these figures or parts or pointed me at where to find them because without the board this impossible task would've become a real mission impossible. BUT AM I DONE NOW!? Since I've been shouting around in my search for Pinky I soon got replies and reactions of people who're telling me Pinky most be one of the most rare Greeks out there because nobody had ever seen one. This might be partially true as its a d#mn hard to find figure but with these fellows from Greece its hard to predict which are really rare and which might show up next week. But there are a few things my quest to this set showed me because we might underestimate the true rareness of the colors because so far Purple has always believed to be the rarest color followed by Pink, Light Blue and Green. But I'm convinced now that this rareness is not a general issue because some figures due show up in the rare colors more often than others. I know at least 3 Purple Rabbits while I only found 1 Pinky during my quest and I have a couple of Light Blue Rabbits (incomplete) and know more completed out there while I only found 1 Green Rabbit. So I think its fair to say that every figure might end up finding their own final Pinky which doesn't mean they've to search for a Pink or Purple figure but maybe another colors will be harder to get for that particulat one. And although I think Pink was in this journey one of the chase colors for me I think I can be very happy and thankfull to Barry who's been trading me a complete Green Rabbit almost a year ago because that could've become the key figure in the end. Mate the photos look amazing well done I'm so happy for you and glad I could help out as much as I did with the pinky. I agree that the rareness isn't allways down to colour in this case but the beast aswell. Some purples you see come up all the time and some greens and blues I've never even seen b4. Well done mate you've worked hard to get these and you deserve them. that pinky rabbit is one of the most cherry figs I've seen for being 26 years old, congrats bro. It's amazing it only took you a year to be honest ,but I know you are a truly dedicated beastformer collector. Job well done mate!! Individually greek beasts just look plain nasty but a full set with the range of colours looks quite appealing. Hats to you for your paitence for completing the set, only a very dedicated collector would have spent the hours/days searching and messaging to complete this lot. Well done! Do you feel satisfied? Or a bit hollow that this search is over? I know when I finally managed to collect a set (trading cards/figures/ whatever) it was more relief that I didn't have to look any more! Thanks for all the kind words here, I'd a great time searching and digging for these little fellows but without the knowledge of this board there would've been no way to get close to a set like this so its thanks to all of you I completed this quest. @Biz, I still have a few projects running behind the scene of which one of them is a 2012 project as well so I hope it'll be completed before the end of the year. And as mentioned I'll still keep a half eye out to search for a mint Light Blue RA. No idea or plans for 2013 yet. But I believe these are pretty hard to find. You have plenty of things to hunt for. You helped me find a Mint Rhino in Box. A Purple Greek Rhino. We still need the rest of the colors haha. Congrats on the Pink Rabbit. Yes I must add I have a tone of greek BB weapons and some are proving real hard to find rabbit being one of them. congrats! The line up is sweet.